Sonic Heroes is a 2003 3D platform game in Sega's Sonic the Hedgehog series. The player races a team of series characters through levels to amass rings, defeat robots, and collect the seven Chaos Emeralds needed to defeat Doctor Eggman. Within each level, the player switches between the team's three characters, who each have unique abilities, to overcome obstacles. Sonic Heroes abandons the action-adventure and exploration-based gameplay of its predecessors Sonic Adventure (1998) and Sonic Adventure 2 (2001) and instead returns to the linear style of Sega Genesis-era Sonic games. The game was the first multi-platform Sonic game, produced for the GameCube, PlayStation 2, Windows, and Xbox platforms. 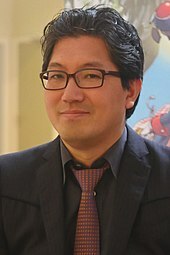 Sonic Team USA's Yuji Naka and Takashi Iizuka led the game's 20-month development. The team wanted Sonic Heroes to appeal beyond Sonic series fans and so designed a game that did not depend on the continuation of its predecessors. The team revived elements not seen since the Genesis Sonic games, such as special stages and the Chaotix characters. Sega released Sonic Heroes in Japan in December 2003 and worldwide in early 2004. Reviewers were polarized. They praised the game's focus on fast gameplay and noted its similarities to the series' original 2D entries, a choice that some considered an improvement from the Sonic Adventure games. Reviewers also highlighted its graphic design and detailed environments and textures. Critics, however, derided the game for not addressing the problems of previous series games, such as poor camera controls and voice acting. Despite mixed reviews, it was a major commercial success, with 3.41 million copies sold by 2007. Sonic Heroes is a 3D platformer. While the preceding Sonic Adventure games for the Dreamcast featured elements of action-adventure and exploration, Sonic Heroes focuses on linear platforming and action, similar to the Sonic the Hedgehog games for the Sega Genesis. The story is also simpler than those of the Sonic Adventure games. In it, series antagonist Doctor Eggman threatens to use a weapon to destroy the world and sends out legions of robots. Four groups of three characters from the franchise's history separately team up to put a stop to Eggman's plans. The player navigates using one of the teams, who serve as the player characters. The teams consist of Sonic the Hedgehog, Miles "Tails" Prower, and Knuckles the Echidna; Shadow the Hedgehog, Rouge the Bat, and E-123 Omega; Amy Rose, Cream the Rabbit, and Big the Cat; and Espio the Chameleon, Charmy Bee, and Vector the Crocodile, respectively. Each team has its own campaign, called a story. Each also represents a different difficulty. Amy's team, for example, is designed for beginners, while Shadow's is aimed at experienced players. The game begins with a tutorial followed by fourteen normal levels and seven boss fights. Gameplay is generally similar in each story: the player must race through levels to advance the story and collect rings for protection and lives. Level themes vary from beaches to casinos. When the player reaches the end of a level, they are graded based on their performance; an "A" rank is highest, while an "E" is lowest. Enemy robots are scattered around levels and must be defeated by jumping on them or other means of attack. The level designs differ slightly between each story. Espio, Charmy, and Vector's levels are distinguished from the other teams' because they are mission-based, requiring players to fulfill a specific objective, like collecting items, to clear a level. Teams contain three character types: Speed (such as Sonic), Flight (such as Tails), and Power (such as Knuckles), which the player toggles between. Speed characters can perform attacks that allow them to lock onto enemies and objects, dash across lines of rings, and can form whirlwinds to climb up poles. Flight characters can temporarily fly and attack airborne enemies, while Power characters can break through objects and glide on gusts of air. By acquiring certain items or enemies, characters can level up, becoming more efficient when fighting enemies. By collecting keys hidden within levels and reaching the end of a level without getting hit, players can enter special stages. In special stages, players dash across a tube, collecting spheres containing boost power while avoiding obstacles. There are two types of special stages: Bonus Challenge and Emerald Challenge. Bonus Challenges are optional and award the player with extra lives. Emerald Challenges task the player with catching a Chaos Emerald before it disappears. If players collect all seven Emeralds and clear each story, an additional Last Story is unlocked. The Last Story reveals the plot was orchestrated by Metal Sonic, Eggman's top enforcer and a robotic copy of Sonic, in an effort to destroy his namesake. Outside the main game, players can unlock promotional trailers to view and music to listen to. The game also features a split screen multiplayer mode, in which two to four players can race or battle. Challenges in the multiplayer mode include kart racing and collecting as many rings as possible. Sonic Heroes was developed by the 19-member Sonic Team USA in San Francisco to commemorate the Sonic series' 12th anniversary. Development was led by producer Yuji Naka and director/lead designer Takashi Iizuka, and lasted 20 months. The majority of the development team had worked on previous Sonic games. Iizuka did not want to make a sequel to Sonic Adventure 2 (2001), as he worried it would only appeal to Sonic fans. Interested in returning to a gameplay style similar to the Sega Genesis games, Sonic Team decided to design Sonic Heroes so casual players not familiar with Sonic could adapt. Iizuka said the development period of Sonic Heroes was the most stressful of his career because of deadlines and Sega management. A fellow designer became ill, so he worked relentlessly, lost 22 pounds, and suffered from insomnia. Sonic Heroes was the first multi-platform Sonic game: it was developed for the GameCube, PlayStation 2 (PS2), and Xbox. Unlike the Sonic Adventure games, which had been made using proprietary software, Sonic Team partnered with Criterion Software to use the RenderWare game engine so the game could be programmed and ported with ease to each platform. Though Sonic Team was able to transfer some textures and models from the Sonic Adventure games into Sonic Heroes, most of their work started from scratch. Sonic Team found challenges in working with the Xbox and PS2, platforms with which they had little experience. The content in all versions is the same, but the PS2 version runs at 30 frames per second (FPS) in contrast to the other versions running at 60 FPS. Sega's Noah Musler explained that running the PS2 version at 60 FPS would have caused performance problems. Iizuka also noted the system is less powerful than the GameCube and Xbox. Iizuka and Naka decided against including console-exclusive content so players could have the same experience regardless of console. 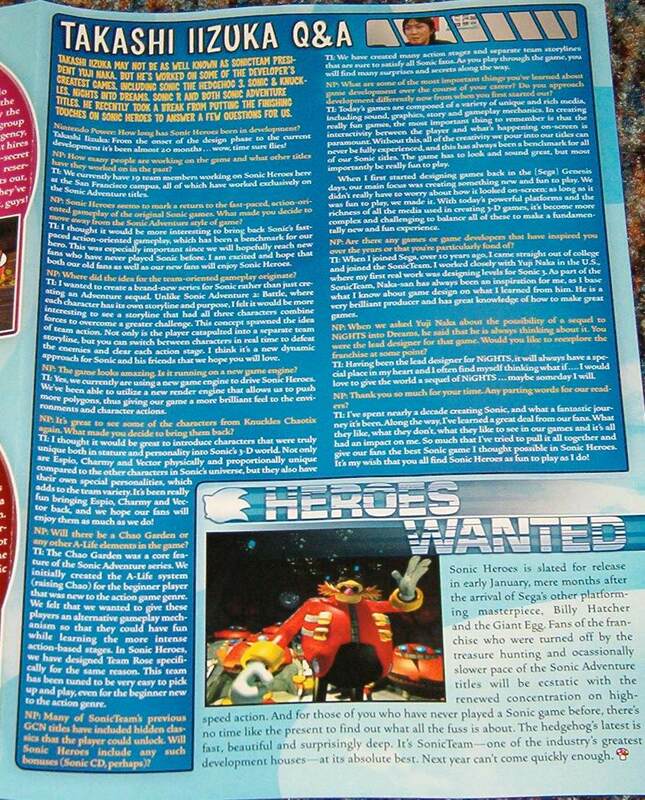 Sonic Team was interested in making Sonic Heroes's narrative feature characters teaming up to overcome evil, rather than Sonic Adventure's approach of individual character stories. This led to the conception of the "team action" concept. Iizuka stated Sonic Team had a considerable amount of freedom in designing the game due to its new scope. The Chao-raising system—a staple of the series since Sonic Adventure—was removed because Sonic Team feared it would disrupt the pace of the game. To improve replay value, the grading system was made more difficult. The special stages from the 2D games were revived to "refresh players' minds" and change the pace. Player reactions to previous games influenced the design; for example, the team did not include modes like Big's fishing from Sonic Adventure and Tails' shooting from Sonic Adventure 2 after both were criticized. The Chaotix, who had appeared in the 1995 spinoff game Knuckles' Chaotix, were revived for Sonic Heroes because Sonic Team thought they were unique and had never used them. Iizuka said he did not consider the Chaotix in Sonic Heroes the same team from Knuckles' Chaotix, claiming to have created new characters using the same designs from 1995. The game marks the debut of E-123 Omega in the Sonic series. Sonic Team wanted to include as many teams as possible, but time constraints and a desire to keep the gameplay balanced prevented this. The game features several computer animated cutscenes produced by Vision Scape Interactive. Jun Senoue composed the majority of the soundtrack. His band Crush 40 performed the main theme, "Sonic Heroes", and the final boss theme, "What I'm Made Of". Other songs were performed by Ted Poley, Tony Harnell, Kay Hanley, and Gunnar Nelson. Iizuka has said that the intention was for the music "to return to the roots of the Sonic experience" and be exciting and fast-paced. Naka believed that Sonic Heroes, a Sonic-themed McDonald's Happy Meal toy line, and the anime series Sonic X would expose the franchise to a new generation of potential gamers. Sega released Sonic Heroes in Japan on December 30, 2003, two weeks later than intended to ensure there were "no compromises" in the final product. The GameCube version was released in North America on January 6, 2004, followed by the Xbox and PS2 versions on January 27. The European version was released on February 2, 2004. A Windows version was released in North America on November 22, 2004, followed by Europe on November 26 and Japan on December 9. The game was rereleased through the Sonic PC Collection for Windows on October 2, 2009, and the PS2 Classics line for the PlayStation 3 (PS3) on February 22, 2012. Reviews for Sonic Heroes were "mixed or average", according to the review aggregator Metacritic. Some reviewers felt the game was better than the previous 3D Sonic games but still below the quality of the 2D games. The PS2 version's reviews were considerably worse than others; reviewers noted clipping, graphic faults, and its lower frame rate. The aesthetics and sound were generally well-received. IGN lauded detailed, varied, and realistic character models, and wrote that the textures were detailed and crisp. They also praised the realistic shading and lighting effects. Although GameSpot thought the graphics were not much of an improvement from previous games—comparing them to "a glorified Dreamcast game"—they still praised its steady frame rate, art design, and vibrant colors. Eurogamer disliked the shiny models, but was still pleased by the imaginative aesthetics. In regards to the soundtrack, Game Revolution found it upbeat and catchy, offering particular praise for the music of Bingo Highway. Although they called the music laughable and not an improvement from previous games, IGN thought the rest of the sound was high quality, and praised its "perfectly implemented" sound effects running in Dolby Pro Logic II. Multiple reviewers wrote that the gameplay was very similar to that of the Genesis Sonic games. GameSpot found Sonic Heroes the closest Sonic Team ever got to recreating the classic 2D Sonic gameplay in 3D. They praised the game for stripping away the shooting and hunting elements from the Sonic Adventure games, and called it "a purer, more action-packed Sonic experience" than previous games. IGN considered Sonic Heroes a major improvement from Sonic Adventure, writing "Sonic Heroes does an absolutely sensational job of re-creating the intensely fast and unpredictable looping, corkscrewing stages from the classic games in 3D". 1UP.com and GameSpy agreed that the game was a step in the right direction for the series. Reviewers called the casino level, Bingo Highway, a highlight. Reviewers were generally divided over the team-based gameplay. GameSpy argued it was well-balanced and thought it greatly increased the replay value. IGN offered similar praise, praising its easy-to-learn, strategic controls. Game Revolution wrote the system added diversity. However, IGN also thought it was not as ambitious as expected and did not change the overall experience. GameSpot agreed the controls were easy, but considered the large number of teams unnecessary: "no one cares about these peripheral characters... People play Sonic games to play as Sonic the Hedgehog". 1UP found the concept was more repetitive than innovative. Eurogamer considered the gameplay original but "boring and obvious" and thought that the controls were clunky and unorthodox. While Eurogamer argued Sonic Heroes was not difficult, Game Revolution described it as hard to a fault, exclaiming they "[died] all the time." The game was criticized for not addressing the problems of prior Sonic games. 1UP wrote the problems with the camera and "hit-or-miss lock-on attacks that leave you plunging to your doom" that plagued the Sonic Adventure games were still present in Sonic Heroes and hurt the experience greatly. GameSpot said although the camera worked well most of the time, coordination between camera position and character movement caused problems, such that pushing forward may not move the character in the same direction the camera is facing. They also wrote that the game suffered from problems with the collision detection and noted all the shortcomings were present in the Sonic Adventure games. IGN agreed the camera had not been improved. The voice acting was especially derided; IGN joked players should "turn down the volume during cut-scenes", and GameSpy compared the voice work to the likes of Playskool. Sonic Heroes was a major commercial success. By October 2004, the game had sold over one million copies in Europe. The PlayStation 2 version received a "Double Platinum" sales award from the Entertainment and Leisure Software Publishers Association, indicating sales of at least 600,000 copies in the United Kingdom. According to Sega's financial reports, Sonic Heroes sold 1.42 million units from its release to March 2004 (850,000 in the U.S., 420,000 in Europe, and 150,000 in Japan), 1.57 million units from March 2004 to March 2005, and 420,000 units in the U.S. from March 2006 to March 2007, for total sales of at least 3.41 million. By the end of 2004, it had been branded as part of the Player's Choice line on the GameCube, the Platinum line on the PS2, and the Classics line on the Xbox. After Sonic Heroes, Sonic Team USA was renamed Sega Studios USA. Their next project was Shadow the Hedgehog (2005), a spinoff starring Shadow set shortly after the events of Sonic Heroes. In 2008, after working on a few more games, the division was merged with Sonic Team in Japan. In 2017 series retrospective, USgamer ranked Sonic Heroes among the franchise's bottom half of games. They wrote that the system of switching between characters was unwieldy and annoying, but still interesting because it made the game feel like a puzzle video game. They also praised the design of E-123 Omega. ^ The Seaside Hill level reappears in the 20th anniversary game Sonic Generations for PS3, Xbox 360, and Windows, while the Nintendo 3DS version includes the special stages and the Egg Emperor boss fight. Seaside Hill has also appeared in Mario and Sonic at the Olympic Winter Games (2009), Sonic & Sega All-Stars Racing (2010), and its 2012 sequel. ^ Casamassina, Matt (July 9, 2003). "Sonic Heroes". IGN. Retrieved September 22, 2018. ^ a b c d e f g h i Fischer, Russ (January 6, 2004). "GameSpy: Sonic Heroes". GameSpy. Archived from the original on February 17, 2012. Retrieved March 13, 2018. ^ a b c d e f g h i "Afterthoughts: Sonic Heroes -- A candid chat with Sonic Team's lord of the rings". Electronic Gaming Monthly. Archived from the original on March 30, 2004. Retrieved November 18, 2017. ^ a b c d e f g h i j k l m n o p q r s Casamassina, Matt (January 5, 2004). "Sonic Heroes". IGN. Archived from the original on March 24, 2018. Retrieved March 2, 2018. ^ a b c d e f g h Dodson, Joe (June 4, 2004). "Sonic Heroes Review". Game Revolution. Archived from the original on March 24, 2018. Retrieved March 3, 2018. ^ a b c d e f g Sonic Heroes (Prima's Official Strategy Guide). Prima Games. 2004. ISBN 978-0761544494. ^ a b c d e f g h i j k Davis, Ryan (January 6, 2004). "Sonic Heroes Review". GameSpot. Archived from the original on August 26, 2015. Retrieved March 2, 2018. ^ a b c d e Bramwell, Tom (February 13, 2004). "Sonic Heroes". Eurogamer. Archived from the original on February 17, 2012. Retrieved March 3, 2018. ^ a b c d e f Bedigian, Louis. "Sonic Heroes Zooms, Spins and Dashes To a Console Near You". GameZone. Archived from the original on February 2, 2009. Retrieved March 1, 2018. ^ a b c d "Takashi Iizuka Q&A". Nintendo Power (173). November 2003. Archived from the original on July 26, 2015. Retrieved August 23, 2018. ^ a b Barker, Ben. "Sonic Heroes- An Interview with the Creators". Xbox. Archived from the original on October 28, 2007. Retrieved March 1, 2018. ^ "Interview: Nights Watchman". Next Generation. December 30, 2007. Archived from the original on February 17, 2012. Retrieved April 17, 2008. ^ Shea, Brian (November 14, 2016). "Where Sonic Went Wrong". Game Informer. Archived from the original on November 16, 2016. Retrieved October 4, 2018. ^ a b Interview section. "Yuji Naka and Takashi Iizuka Speak on Sonic Heroes". Sega. Archived from the original on March 21, 2006. Retrieved April 1, 2014. ^ Bramwell, Tom (May 28, 2003). "Sonic Heroes uses RenderWare". GamesIndustry.biz. Archived from the original on March 24, 2018. Retrieved March 1, 2018. ^ Dunham, Jeremy (December 2, 2003). "Sonic Heroes Profiles: Team Dark". IGN. Archived from the original on April 7, 2014. Retrieved March 28, 2014. ^ Hulfish, Garrett (May 8, 2017). "Previously unknown Sonic skateboarding game has been revealed in video". Digital Trends. Archived from the original on September 20, 2017. Retrieved March 2, 2018. ^ "Sonic Heroes - Original Soundtrack". AllMusic. November 9, 2004. Archived from the original on January 15, 2017. Retrieved March 2, 2018. ^ Tochen, Dan (November 5, 2003). "Sonic Heroes Japanese release delayed". GameSpot. Archived from the original on November 8, 2017. Retrieved March 1, 2018. ^ Calvert, Justin (January 27, 2004). "Sonic Heroes ships for the PS2 and Xbox". GameSpot. Archived from the original on March 24, 2018. Retrieved March 1, 2018. ^ "Sonic Heroes". Eurogamer. Archived from the original on March 4, 2016. Retrieved March 1, 2018. ^ Casamassina, Matt; Lewis, Ed (December 10, 2004). "Sonic Heroes". IGN. p. 3. Archived from the original on January 21, 2018. Retrieved September 6, 2018. ^ "Achat Sonic Heroes sur PC". Jeuxvideo.com (in French). Retrieved September 6, 2018. ^ "Sonic Heroes Japanese Official Web Site" (in Japanese). Sega. Archived from the original on February 15, 2018. Retrieved September 6, 2018. ^ Sega (October 2, 2009). "Sonic PC Collection (PC)". GamePlanet. Archived from the original on March 24, 2018. Retrieved March 13, 2018. ^ Sega Europe LTD (February 22, 2012). "Sonic Heroes on PS3". PlayStation Store. Archived from the original on March 24, 2018. Retrieved March 1, 2018. ^ a b "Sonic Heroes for Xbox Reviews". Metacritic. CBS Interactive. Archived from the original on June 8, 2012. Retrieved March 2, 2018. ^ a b "Sonic Heroes for GameCube Reviews". Metacritic. CBS Interactive. Archived from the original on June 8, 2012. Retrieved March 2, 2018. ^ a b "Sonic Heroes for PC Reviews". Metacritic. CBS Interactive. Archived from the original on June 8, 2012. Retrieved March 2, 2018. ^ a b c "Sonic Heroes for PlayStation 2 Reviews". Metacritic. CBS Interactive. Archived from the original on June 8, 2012. Retrieved March 2, 2018. ^ a b c d e f g 1UP Staff (January 1, 2004). "Sonic Heroes Review for GC". 1UP.com. Archived from the original on June 25, 2011. Retrieved March 4, 2018. ^ Casamassina, Matt; Lewis, Ed (January 23, 2004). "Sonic Heroes (PS2)". IGN. Archived from the original on January 22, 2018. Retrieved March 4, 2018. ^ "PlayStation 2: Sonic Heroes". GameSpy. January 31, 2004. Archived from the original on February 9, 2005. Retrieved August 23, 2018. While Heroes has had a bright debut on the GameCube and Xbox, framerate issues plague the PS2 version, rendering some of the fastest areas (like the pinball on crystal meth "Casino" level) a stuttering mess. ^ Bramwell, Tom (February 13, 2004). "Sonic Heroes". Eurogamer. Archived from the original on February 17, 2012. Retrieved March 3, 2018. ^ a b Van Autrijve, Rainier (October 29, 2004). "Sonic Is Sega's Hero of Sales Figures". GameSpy. Archived from the original on February 17, 2012. Retrieved January 11, 2009. ^ "ELSPA Sales Awards: Double Platinum". Entertainment and Leisure Software Publishers Association. Archived from the original on May 20, 2009. ^ "Sega Corporation Annual Report 2004" (PDF). July 2004. p. 13. Archived (PDF) from the original on March 10, 2018. Retrieved November 27, 2017. ^ "Sega Sammy Holdings Annual Report 2006" (PDF). July 2006. p. 47. Archived (PDF) from the original on March 30, 2016. Retrieved November 27, 2017. ^ "Fiscal Year Ended March 2007 Full Year Results" (PDF). May 14, 2007. p. 15. Archived (PDF) from the original on July 29, 2016. Retrieved November 27, 2017. ^ Smith, Sean (2006). "Company Profile: Sonic Team". Retro Gamer. No. 26. Imagine Publishing. pp. 24–29. ISSN 1742-3155. ^ Deci, TJ. "Shadow the Hedgehog for GameCube Overview". AllGame. Archived from the original on November 15, 2014. Retrieved January 26, 2009. ^ "Game of the week; Shadow the Hedgehog; GameCube/PS2/Xbox (rrp $79.95) Rating: 3.5/5". Herald Sun (1): F02. February 26, 2006. ^ Jarvis, Matthew (April 1, 2016). "Sonic Team head returns to US to establish development 'hub' for franchise". MCV. Archived from the original on July 14, 2018. Retrieved July 14, 2018. ^ USgamer Team (August 18, 2017). "Gotta Go Fast: Ranking All of The Sonic The Hedgehog Games". USgamer. Archived from the original on August 25, 2017. Retrieved August 23, 2018. ^ Shea, Brian (August 24, 2017). "New Tag Mechanic Stirs Up Sonic Heroes Memories". Game Informer. Archived from the original on December 2, 2017. Retrieved March 24, 2018. ^ a b Knezevic, Kevin (July 11, 2018). "Sonic's New Game Makes Racing Much More Cooperative". GameSpot. Archived from the original on July 10, 2018. Retrieved July 11, 2018. ^ Towell, Justin (October 31, 2011). "Sonic Generations review". GamesRadar+. Archived from the original on January 26, 2018. Retrieved March 24, 2018. ^ "Sonic Generations - Mushroom Hill Special Stage Clip". IGN. November 21, 2011. Archived from the original on August 30, 2017. Retrieved October 23, 2017. ^ Dimps; Sonic Team (November 22, 2011). Sonic Generations. Sega. Level/area: Egg Emperor. ^ Newton, James (October 16, 2009). "Mario & Sonic at the Olympic Winter Games Review". Nintendo Life. Archived from the original on February 21, 2018. Retrieved April 7, 2018. ^ kombo (May 4, 2012). "Media: Sonic & SEGA All-Stars Racing – Knuckles Gameplay and Roster Info, Plus Clues to Solve". GameZone. Archived from the original on April 7, 2018. Retrieved April 7, 2018. ^ Krupa, Daniel (August 13, 2012). "Sonic & Sega All-Stars Racing Transformed". IGN. Archived from the original on April 7, 2018. Retrieved April 7, 2018. This page was last edited on 31 March 2019, at 00:10 (UTC).